Mission statement: To encourage Duxbury to become more sustainable by informing ourselves and the community about practical energy-saving measures, adapting them ourselves, facilitating their use by others and supporting town, state and federal energy independence initiatives. Our small group has grown in number with over 80 residents now on the mailing list and a very active core group of 15-25 members ranging in age from 18 to 88. Our meetings are on the first Wednesday of the month at 7:30, upstairs at the Senior Center. New members are always welcome! Just show up. For information call Janis Owens at 781-934-2307 or Fenna Hanes at 781-934-0248. See Our Blog for more information about solar energy and what happened at our panel discussion. There will be another panel discussion March 23, 2017 so stay tuned for more information. 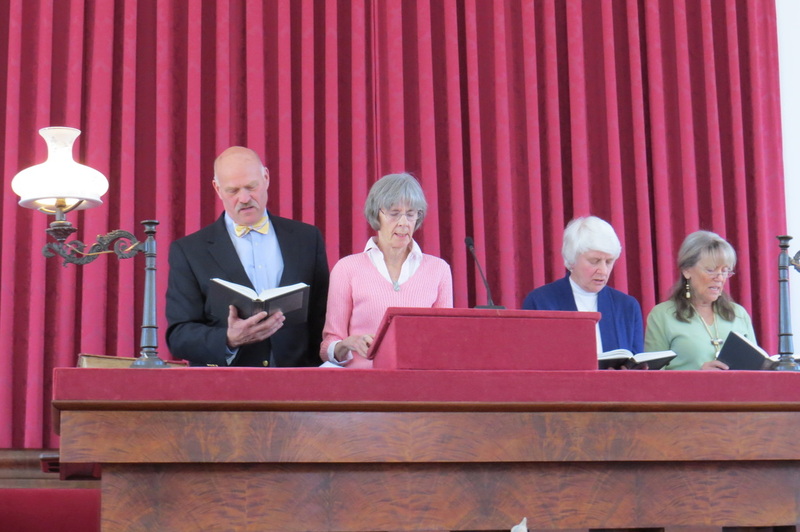 Co-Chair Mike Wilson gave a great sermon and talk about Sustainable Duxbury and our environmental work. It is great presentation on who we are and where we came from. Here is the full text of that speech. "Good morning. 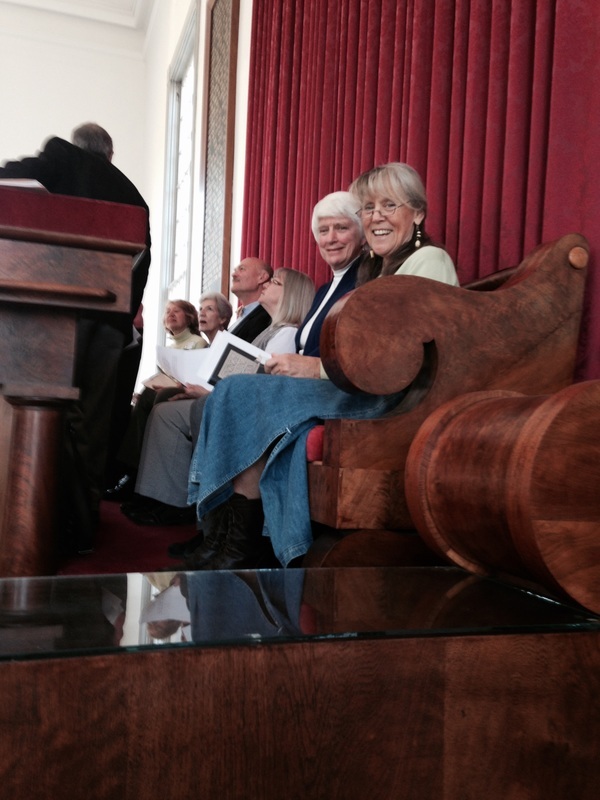 My name is Mike Wilson, a member here at 1st Parish, and current co-chair, with Fenna Hanes, of Sustainable Duxbury. When Carrie Meir approached Jim Savicki about Sustainable Duxbury being involved in the Earth Day service, we jumped at the opportunity. As I gathered my thoughts as to what I would share with you, two things came to mind. My first introduction to becoming a responsible steward of planet Earth came in the small town of Granby, CT where I grew up, the year 1968. There was a big initiative in town to recycle glass and with 2 large dump trucks parked in the parking lot of the Lost Acres Volunteer Fire Dept, we spent the day collecting glass, filling the trucks while standing in the truck smashing glass with a sledge hammer to make more room. The first Earth Day was still 2 years away. We raised $22,000 in the New England Wind Fund Solar Challenge and the town was rewarded with a solar array and educational software that was installed at the Chandler School. The array generates approx. $800-1000/yr of solar power and is our lasting contribution to alternative energy sources, like wind and solar, and less reliance on fossil fuels. With assistance from our friends at Island Creek Oyster Co., we installed two hydration stations in the old high school and one in the Middle School, which led to their inclusion in the design at the new high school, trying to cut down and eliminate the use of bottled water and the generated waste of discarded empties, of which 80% don’t even get recycled. Last fall we participated in gathering over 100,000 signatures to place an expansion of the bottle bill deposit law to include sports drinks and plastic water bottles on the ballot. We succeeded in placing it on the ballot but were exponentially outspent by the opposition and soundly defeated at the ballot box. Last spring we purchased 4 recycling bins for use at the Coppens Field soccer complex and Train field and they were so successful the town bought 6 more to place around town to recycle these plastic bottles and remove them from the waste stream. In 2013 after years of searching for a location, we spearheaded the development of a Community Garden on the 13 acre Stewart property on Bayridge Lane. When the Stewart brothers died, the land was placed in a trust, was to remain open space and not to be developed. John McCloskey, a Duxbury resident, lawyer and local oyster farmer, was put in charge of the trust and contacted us having heard of our quest for land for a community garden. Now in its 3rd year, we have 23 12x12 plots with incredibly happy people digging in the dirt and many growing their own vegetables for the very first time. Lastly we have hosted a number of films and panel discussions, many in conjunction with the Duxbury Free Library, to further raise awareness of the many environmental issues we are facing and how people might get involved to make a change. Among the presentations, Sea Change: Reversing the Tide with environmentalist Roger Payne; Crucial Waters: Report of the World Oceans with National Geographic photographer Brian Skerry. Great Migrations with National Geographic film maker David Hamlin. Films Switch, Chasing Ice and our most recently completed film series, in honor of the Year of the Soil, Symphony of the Soil and DIRT: the Movie, sandwiched around a panel discussion that included experts on organic gardening and lawn care and the care of our ground water, one of our most precious natural resources . Our current projects include preliminary work on addressing the use of plastic shopping bags and the possibility of town wide composting. How can we make it happen here in Duxbury? That is where you come in. 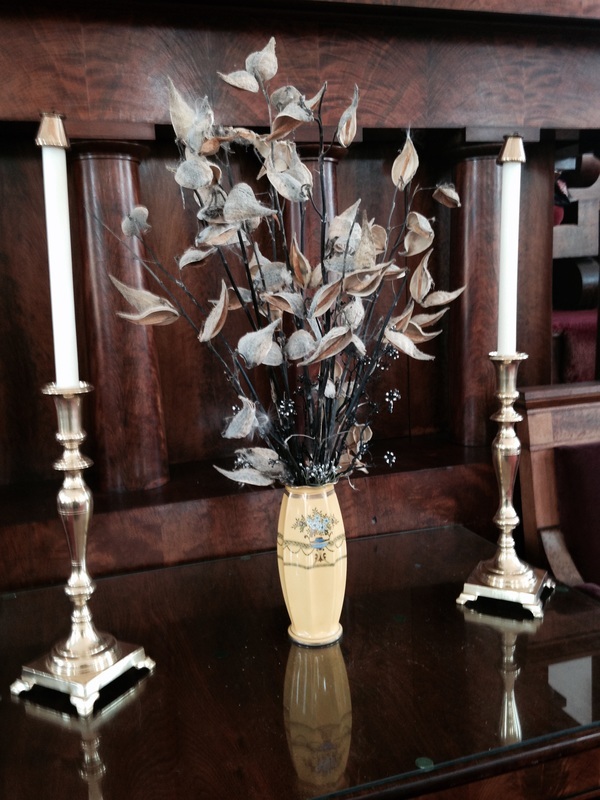 We meet the first Wed of every month Sept-June at the Duxbury Senior Center at 7:30 pm. There is so much to do. We need your help to make the world a better place to live. Won’t you come and help us make a difference? Thank you." Rachel Carson was celebrated in the spring issue of The Planet, an environmental magazine published by Western Washington University. Lauren Owens (daughter of Sustainable Duxbury's Janis Owens) did a video on the topic of DDT and Silent Spring along with the beginnings of the environmental movement. You can see this video by clicking here. And you can visit The Planet by clicking here. The Spring 2012 issue is the one that was dedicated to Silent Spring. Our thanks goes out to Brooke McCarthy for her wonderful photography! A warm welcome to the Rachel Carson Sanctuary on a beautiful day in May. 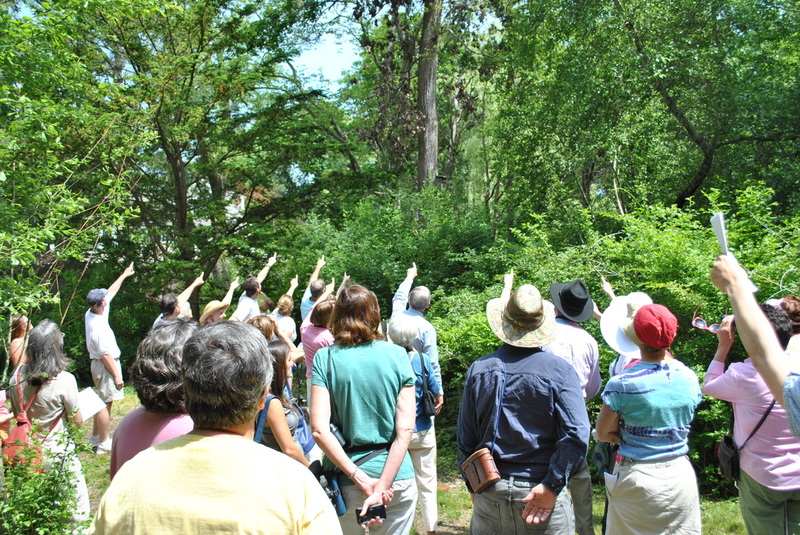 Peter Alden, Author and Naturalist, lead bird watching walks. Betsy Sullivan declares this day Rachel Carson day. Members arranged showings of the films “An Inconvenient Truth” and “Who Killed the Electric Car” at the public library. Both were well attended. Members also attended the MCAN conference on global warming at MIT. Members offered assistance to the town’s Alternative Energy Committee who were looking into possible sites for wind turbines in Duxbury. 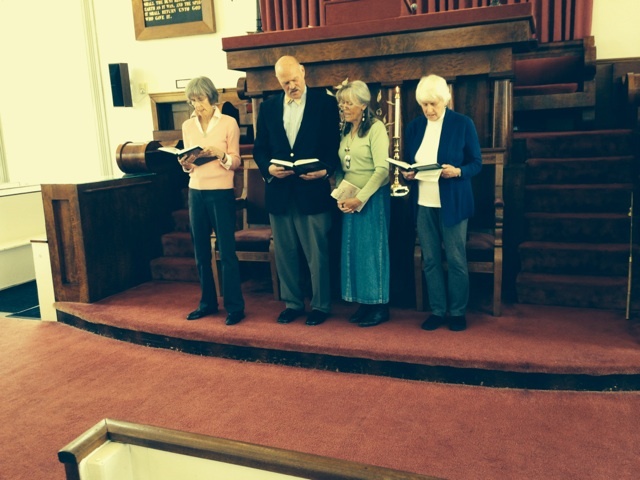 Members took part in the Earth day celebration at First Parish Church. We successfully helped over 200 families reduce their junk mail by taking part in the “Stop Junk Mail” program offered by the Massachusetts Department of Environmental Protection. 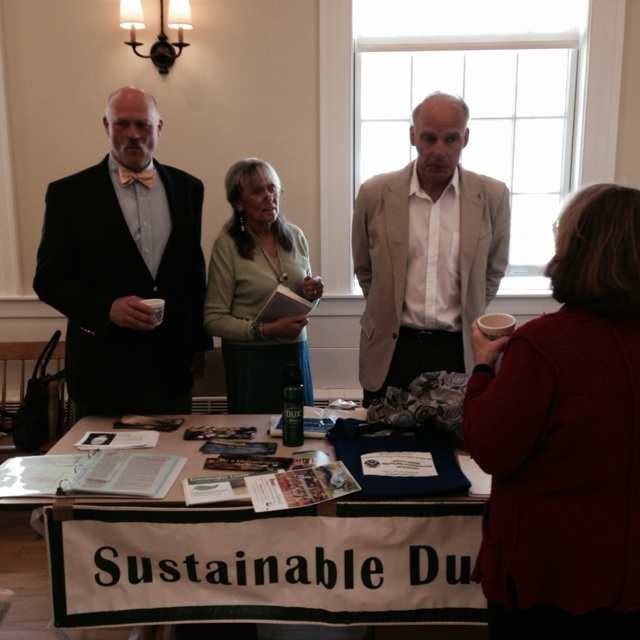 Members manned a table at town meeting handing out energy saving material. We participated in the annual Fourth of July Parade with hybrid cars and bicycles and handed out energy saving literature. We helped convince Selectmen and citizens by speaking at several meetings of the value of a “Save As You Throw” program.This program was enacted and currently saves Duxbury approximately $20,000 per month or $240,000 a year.In addition the program has reduced the annual sticker fee for use of the recycling station. We took part in the annual Fourth of July parade which used the theme of “Our American Heroes”. We selected as our hero Rachael Carson.Her book, Silent Spring, was inspired by the number of birds killed in Duxbury due to DDT use in the 1960’s. Thanks to Duxbury citizens, we raised $22,000 for the New England Wind Fund Solar Challenge. As a result, the Town received a solar array and accompanying educational software. These were installed at the Chandler School in June 2009. This software will be integrated system-wide in science and math curricula while also educating students in PC technology. We organized a “sell out” presentation called “Sea Change: Reversing the Tide” by world renowned environmentalist, Roger Payne and his wife Lisa Harrow. The event also included an environmental fair. Roger Payne is the president and found of Ocean Alliance. He has been studying our oceans for over 50 years and recorded the first whale songs. His wife, Lisa Harrow, wrote the book How Can I Help. She is a world famous actress of stage and screen. Some members participated in a “Project 350” action on the 350th day of 2008 by ringing church bells 350 times.This world- wide movement staged events like this to raise awareness of the need to reduce the amount of carbon in the atmosphere to 350 ppm (particles per million).Rates much higher than this would make our planet unsustainable. Sea Change with Roger Payne and LIsa Harrow. In late 2008, Massachusetts began a three-year trial of a public bus service (GATRA) to run from Independence mall through Duxbury to Marshfield. A team of our members actively encouraged ridership through posting bus information around town and handing out schedules at the train station and “Foodies”. Another team worked with the town’s Agricultural Commission to find land and water for community vegetable gardens in Duxbury. Sustainable Duxbury made available for members the use of a power-cost monitor and kill-A-Watt-meter. This kit assisted members in reducing their home energy consumption. Members also had access through Sustainable South Shore to a thermal imaging camera that will help homeowners reduce wasted energy/heat in their homes. In celebration of Earth day 2009 a team of members wanted to bring attention to the number of plastic bags we use and have in our society today. They gathered information on plastic bags and collected all the bags that were put into the recycling area at the recycling station over a five day period. Their plan was to tie the bags together and display them at some visible place in town. As soon as the collecting started it was obvious that tying them together was out of the question. Members collected an estimated 24,150 bags of all sorts and tying them together would have resulted in a chain of bags over five miles long. The bags were gathered at the beach and the recycling station for a photo and information on reusable bags was handed out at both locations. The event was a huge success in pointing out how many bags the average Duxbury home uses in a week. During the summer crews from NEXAMP and local electrician Orie Fontaine began installing the 2.4 KW solar panel array at the Chandler school. The panels are located in the court yard where they may easily viewed. The panels were activated in August. A "Ribbon Cutting" ceremony is planned for September 2009. Sustainable Duxbury took part in the annual 4th of July parade for the third time. This year the theme for the parade was "Celebrating our American Heritage" and our float displayed a Duxbury home complete with solar panels, a windmill, and a garden. The float was preceded by a banner that said "Creating a Greener Heritage for the future. along with the usual candy thrown to spectators we gave away roughly 200 reusable shopping bags donated by local markets: Foodies, Stop and Shop, and Hannifords. The float team was headed up by Emily Averna, our youngest member who was a sophomore at American University in St Louis in the fall. It won a fourth place ribbon. The solar panels at Chandler school were officially presented to the town at a ceremony in September attended by Members of Sustainable Duxbury, town and school officials. Ten High School and Middle School teachers attended a day long in-service training program run by the soft ware provider, Heliotronics. This software was integrated into the science and Math curricula in grades 5-12. 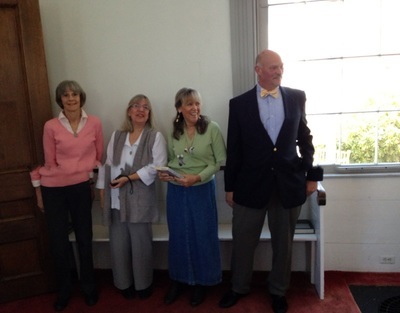 On October 24 we were able to get several other churches, Pilgrim Church and St. Johns Church, to join us in ringing the church bells 350 times at 3:50 pm as part of a global day of awareness. This day was observed world wide and was crucial in getting the number 350 entered into the proceedings at the United Nations conference on Global warming held in December. Scientists world wide now believe that to preserve life on this planet as we know it we need to bring the concentration of CO2 back down to 35ppm. It is presently at 378ppm and climbing. 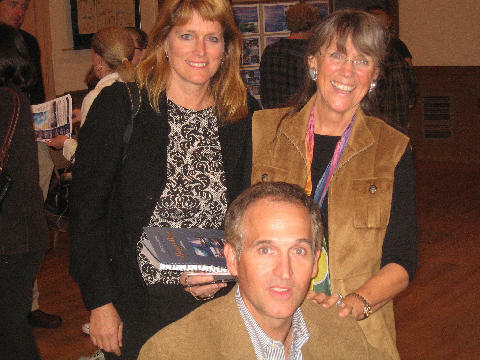 On November 1 Sustainable Duxbury hosted National Geographic photographer, Brian Skerry, who gave a talk before hundreds of people at First Parish Church. Brian is a world class underwater photographer and his talk was entitled "Crucial Waters: Reporting On The World's Oceans." The talk was followed by a book signing session and environmental fair in the church hall. Many thanks to Judi & Terry Vose for bringing Brian to Duxbury. October marked the fourth birthday of Sustainable Duxbury and we celebrated the event with a party at the home of Jim and Donna Savicki. Our Earth Day project was to count the number of plastic bags thrown away in one week. Solar panels being installed at Chandler School. In April Sustainable Duxbury, as part of its anti-plastic campaign, presented members of the School Committee and Board of Selectmen with green reusable stainless steel water bottles that say "Dux Water" on the side. We asked that they use these water bottles at all future televised meetings so that viewers would not see them using commercial plastic water bottles that are so bad for our environment. They were very receptive to the idea but the selectmen needed to be reminded by an editorial in the Duxbury Reporter in September, entitled "What happened to the bottles?" On June 26, we were part of a national event called "Hands Across The Sand" when over 200 people gathered on Duxbury beach to hold hands and draw a virtual line in the sand against off-shore drilling. This event was one of hundreds staged simultaneously across the country coordinated by 350.org. In September we worked on the Island Creek Oyster Festival. A team consisting of Jim Savicki, Mike Wilson, Judi & Terry Vose worked with The Island Creek Oyster Co. for two years helping to green up their annual festival. This "Green Team" has with the help of Island Creek turned the festival into a model for other such events. At this year's festival, which was attended by over 3,000 people, all cups, plates and flatware were compostable. No prepackaged food was sold and all food eaten was cooked at the festival. No bottled water was available at the festival but people could get water "Straight from Duxbury" at several hydration stations. A team of over 50 volunteers helped with composting and single stream operations. For the second year all oyster shells (approx 40,000) were sent to the Jackson Estuary project in NH to help reclaim oyster beds in that state. In October we participated in the "10/10/10 Green World Wide Work Day" by donating and helping to plant four trees at the newly reopened Tarklin Community Center. This day is meant to say to politicians, "we are getting to work to save the environment—how about you?". Again, in conjunction with 350.org.